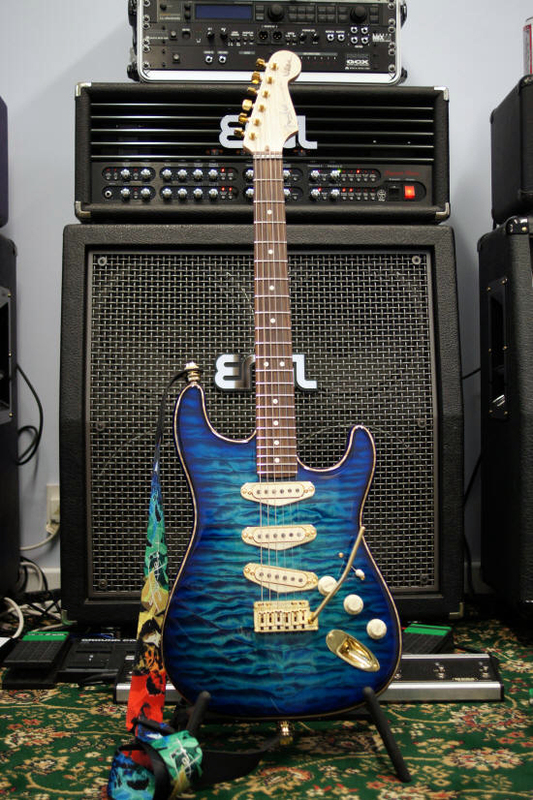 A Fender custom guitar review of the guitar I call 'Blue' which I made in 2011 mainly from Fender Stratocaster parts and a Warmoth body. Wow, what a fantastic looking fender (surely not?) body - and on the guitar - it's even better. You know, when I had finished making 'Brownie' (my previous fender stratocaster) I thought that for the money there is no way that I could ever improve on that guitar (check it out from-here) - the sound was awesome, the feel of the guitar was great and the playability - well you could play it (it felt like) forever. And that guitar was light... which for an older guy like me matters. Picking up a Gibson Les Paul these days is hard and getting harder all the time, that weight is a killer, but having a Les Paul around your neck for hours is nigh on impossible. I was determined to make the best stratocaster in the world - yes really - even though 'Brownie' ended up being that guitar. I have had many Fender guitars over the years - and indeed have a Fender olympic white USA stratocaster as I write which I customised a little for the look with 'Fatboy' parts from the Isle of Wight (remember Jimi playing there?) and that guy really is fantastic - check him out sometime his parts are recommended. In any case as you can see from the specifications above I did not set out to play around building the 'best' stratocaster in the world - I think some will disagree, there's always a few, right? But for the rest of us I suspect most guys will like this guitar; and indeed the feedback on this one has always been awesome. Let's run through those parts above in a little more details and the reasons for choosing them. The Fender Jeff Beck neck has a reputation that precedes it. As I write, just yesterday I was in my local guitar hangout, (Hi Scott, Chris and the others) and discussed this guitar. As soon as I mentioned the Jeff Beck neck - Scott chirped in 'Oh so you want a tree for a neck then?' Well, if you are not absolutely up to speed then that's the assumption. But those are the 'old' Jeff Beck necks. The one I chose here is from a Jeff Beck 2011 (or late 2010) model and I can tell you this neck is awesome... perfect slim(ish) feel like a 62 stratocaster and does not 'choke off' anywhere on the neck - not even at the top. The neck I bought looks like rosewood on maple. It also has a roller nut which helps with tuning. How do you get one of these necks? Well firstly you will need lots of money - no one sells these cheap - that is, if you can even find one for sale. This neck, with shipping and the money we here in the UK have to pay some greedy bas****s in London totalled £450.00 (US$ 700.00). Now I know you USA boys might say that's expensive, but where I come from it's expensive too... no only joking, actually for the UK its cheap(ish). This neck was bought off eBay from the guy who always breaks down new stratocaster's and sells the bits. You will find him if you look. He's not cheap, but his parts are perfect. The Jeff Beck neck has the roller not fitted as standard so that's one of the things I wanted because of lack of stability of tuning on stratocaster's from my experience and I really do want the best guitar in the world, right? 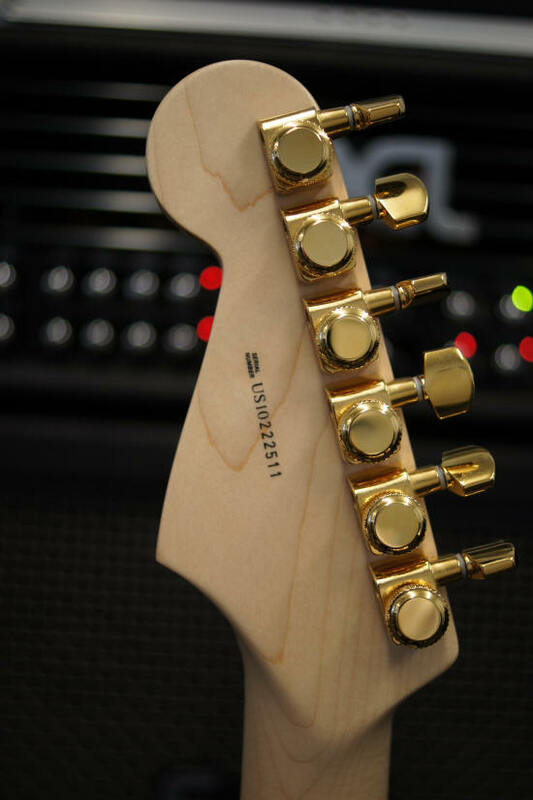 The Fender Roller Nut as fitted to the Jeff Beck neck. I never found a gold one. Click for larger image. Warmoth is a well known Fender authorised manufacturer of custom and not so custom bodies for many guitars. I had gained much experience from Warmoth over the years and have bought at least four previous bodies for Fender Stratocaster's that I have made. Even the 'orange flamed' stratocaster you see in my pictures has a Warmoth body. So I felt that Warmoth could be trusted to make a body like no other - in fact the best Fender Stratocaster body in the world. Price would not be important - but the body would. So I set out to buy the body from them. 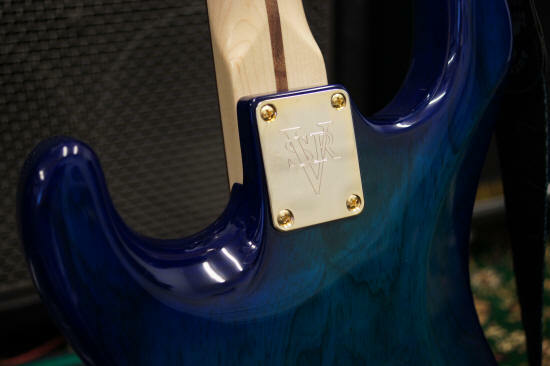 Warmoth have two ways of buying bodies from them - either premade 'off the shelf' bodies, or completely custom - with a massive hike in price for the privilege of having them make it. Fender 'original' shaping on the body in other respects such as belly carve etc. Well that's a fine specification for any guitar. Lets take a closer look at what happened from Warmoth. Very Light Swamp ash: They got this spot on - eventually making a body (non hollowed) of just 3.1 Lbs. in weight. The Quilted Maple Top: They got this exactly right. Warmoth could not really get it wrong. I personally chose this top wood from about nine or ten 'top woods' in the quilted maple section of the custom build area of their web. It increased the body cost dramatically - but I'm pleased to say (and I hope you agree) that this top really is one of the best in the world you have ever seen... check those images at the top of this page. Rear Routed Body: Warmoth got this exactly right - and the controls eventually fitted perfectly. You will notice (if you watch my video build on this guitar) that I had to 'file out' the pot holes (no, not those on the highway) to make the pots fit. Pots were genuine Fender - so should have fitted, but Warmoth left the over spray in the holes making them unable to take the pot. That's nothing new really so get your file out - but be careful! 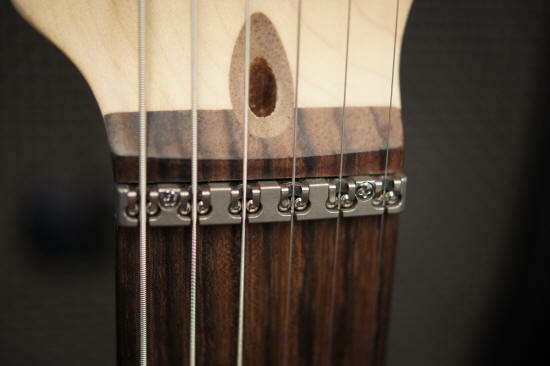 The .720 Modification to the neck pocket: This modification is usually used if you have a rear routed control compartment. The reason is, that if you do not do this, then the neck sits a little higher in the body (to facilitate the scratch plate). Of course, with a rear routed body there is no pick guard so you can 'afford' to drop the neck by .720. This makes the neck sit right in this body. and Warmoth got this one right too. And so they should. Jeff Beck Easy Reach Neck Joint: Ouch. When I got this body back this is the first thing I noticed. Warmoth did not do as they were told... no matter how much money you throw at something and trust someone to do things that you want they just don't do it. 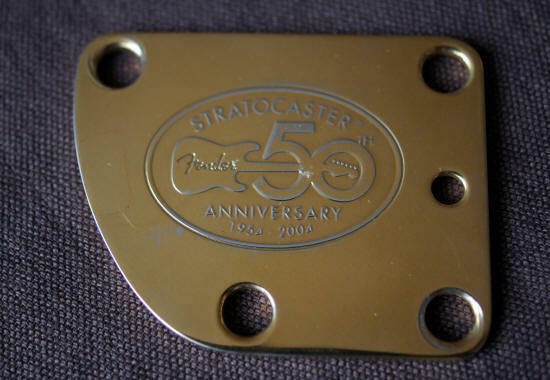 This mistake caused my Fender 50th gold neck plate to be relegated to the dustbin (nice - bearing in mind the seller wanted US$200). This caused me to reconsider the neck plate. I used a chrome one in the build but later replaced that one with the one in the picture below. Bang.... I just shot the Warmoth rep.
And here's what I got! Here's an image of the neck plate mounting that I originally wanted (this is the image I sent to Warmoth and on the right is what I got... as you can see, the angled bit is basically correct but the contour (the rounded bit) and the drilling is simply wrong. Why Warmoth did not bother is beyond me - because they confirmed it all by email. Not rocket science but when you pay this sort of money it takes the mickey... and I don't mean mouse. Dual Battery Compartment for later: Ouch again. They got this wrong too. There was none! And now its really too late to get it done. This did not cause me problems today... it might in the future. The neck problem on the other hand was a real pain. 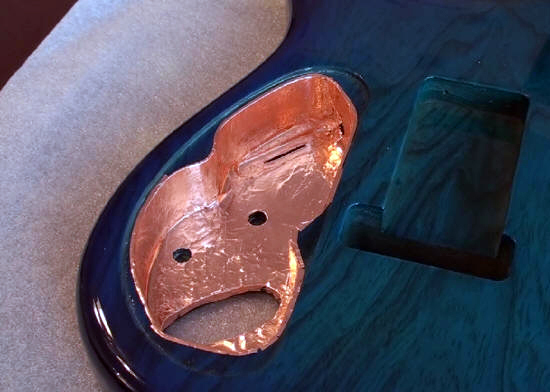 Fender Body Contour: Warmoth got this right. I would have been really concerned if an 'Authorised' manufacturer could not get the Fender body shaping correct... you might be too? 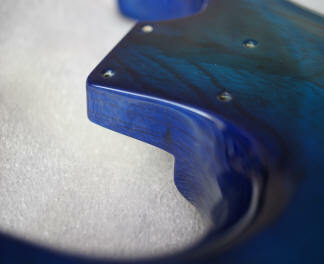 Blue burst Finish and Natural Masking: Warmoth did an excellent job of this finish. One reason why I had to wait nearly two months for the body! Body Weight: The final body weight without any chambering (I really wanted a solid body like the original Fender Stratocaster) was 3.1 Lbs.... is that a record? Maybe not - but it's as light and resonant as any body it is likely you will ever see - oh and get one from fender? I think not. This has been a review all in itself let alone a whole review. The body was perfect - except for where they got it wrong. It caused me much pain especially in the neck mounting area and being unable to use the neck plate that I wanted to fit (it was a fantastic neck plate and would have rounded this guitar off perfectly). In some ways it was disappointing to me - and it would have been to you too - if your specification was not met at this price. In any case, I eventually got nowhere with Warmoth so I just carried on with this body. It's a pity they got it wrong - its the first time I have had issues with them - but unfortunately it was on the most expensive body I ever bought from them too. Rating for this is 6 out of 10 - so there. Seymour is a very well respected pickup manufacturer. In fact he makes these particular pickups one at a time himself. That's right - HE makes them. And with the number of years Seymour has been around, I guess he has had some practice. Seymour Duncan is no fool. Make no mistake of that. And while the art (???) of making things look old is the current flavour of the month these pickups go way beyond that. In fact these pickups are as near as you can get (short of the real deal) to 1953 HOT Stratocaster pickups arguably from ANY manufacturer in the world. And as you can see, Seymour serializes each one, matches them as a set (if that's how you buy them) and signs each and every one he makes. I will at some stage (time permitting) be publishing a complete review of these pickups as you get them - and exactly how I find them... whether good, bad, or just bunkum marketing hype as often pickup manufacturers lend to their marketing. These pickups don't disappoint. I chose these pickups because I cannot find nearer specs to those 53 pickups anywhere in the world. See even Seymour is convinced... but then again he would be! But seriously, these are nice pickups and we shall see if they are really as good as he says. I had heard some pretty good things about the Bladerunner for a Fender Stratocaster. But until recently they only made chrome units. But when they decided to make the gold one and release it at the time I was making this stratocaster I just ordered it. 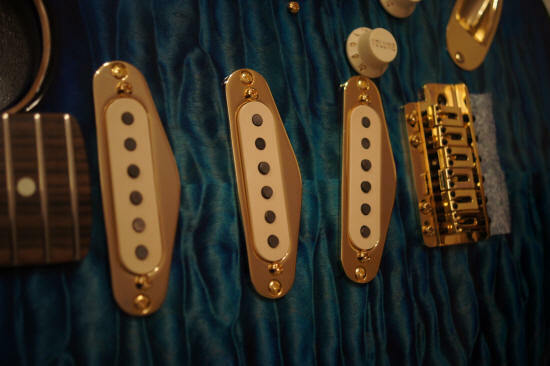 Originally I was fitting a regular Gold Fender tremolo unit and had the body routed and drilled for that. But the Bladerunner just slips right in there so that was no problem. The Bladerunner took some time to get to me and US$ price (if I remember was $150) that's £100.00 to all you English dudes. And if you reside in a forum (don't you just hate those guys) then its £500.00 to you. But seriously, this unit, by the time it got to the UK with all that money for nothing (you know, the tax) and the money that the post office pile on as 'clearance' the total was over £140.00 or thereabouts. I could not find these in the UK anywhere. USA1 UK 0. This tremolo is reviewed on other pages on this site. 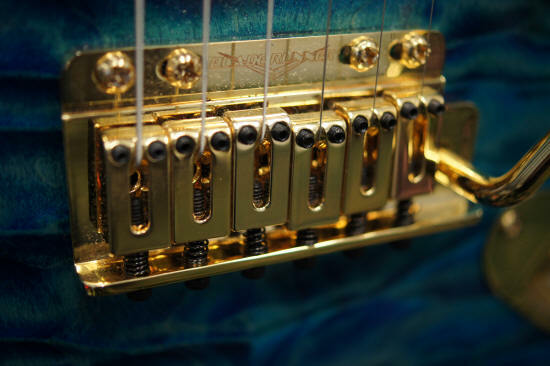 Basically, the Bladerunner uses a piece of spring steel (that will never go out of shape they say) and stops all that clunking around of the original Fender tremolo. They are right it does. But one thing that was useful for me was that because I had done the .720 modification, this tremolo allowed me do drop the action to the new lower height overall of the neck no problem. The trem arm snaps in to place and stays there. Good. 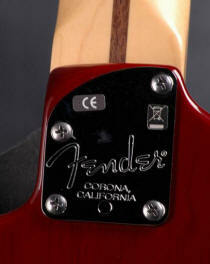 The Fender Jeff Beck guitar comes with matt fender locking tuners as standard. But I wanted to find the 'gold' version to go with all the other gold stuff on this guitar. That choice proved to be expensive here in the UK. 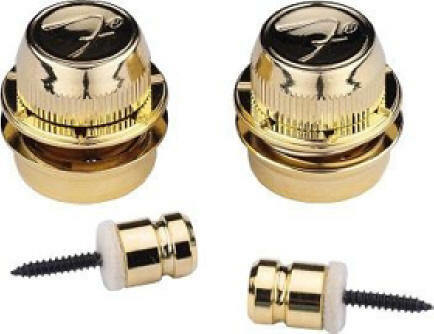 In fact I never did find these fender gold locking tuners anywhere in the UK. I searched the internet for weeks - but eventually my old friend on eBay with all those Fender strip outs had some. Needless to say, he wanted $140.00 - so I paid and by the time they got here read £125.00 - ouch. In any case I had the right things on the peg head and was happy that I got some eventually. Fender guitars (at least the good ones ;-) and noise go hand in hand (actually I'm only joking) but you CAN solve that noise with careful and concentrated screening of the body cavities. I was going to do this to my wife to make her quieter but she declined at the last minute.. doh.. 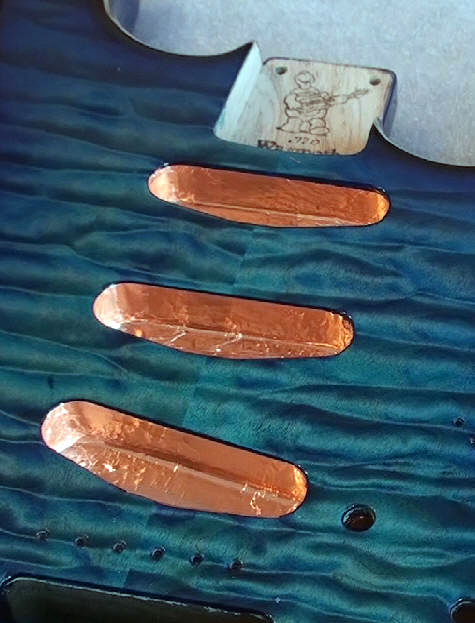 This sort of shielding with copper tape that the sticky stuff conducts electricity is what you need. Finally mask off the copper to stop shorts going on. This shielding contributed to the reduced noise floor of this guitar - bearing in mind that essentially this guitar had 1953 (or as near as you can get) pickups that did not know about noise in the way we have it today - damn that digital stuff. Throughout the build of this guitar I wanted to make the thing flawless with as 'perfect' a sound that I think a Fender Stratocaster should have. Now my idea of that might well be different to yours. That's because of two things - firstly we are all individual guys and I might like things on there you don't - and secondly, because one persons ideal and ultimate tone is not the same as someone else's. 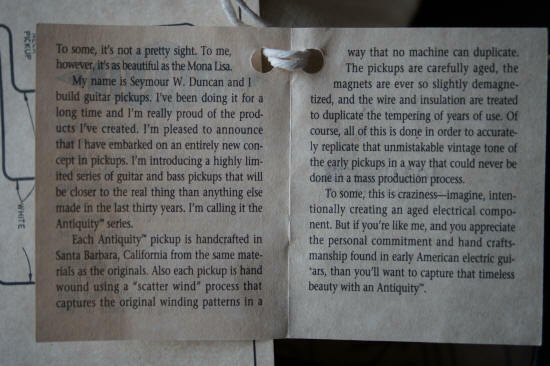 Think about what Jimi Hendrix got out of a $350 guitar back in the day. But I think about electrics and that other good stuff like this. If it was good enough for Leo Fender - (and indeed Jimi Hendrix) then it's more than good enough for me. I have updated the design of this guitar in other places like the trem, but that basic sound I want to keep. So I used Fender components for the electrics, just like those fitted for many years and probably very similar to the original ones that Leo used. The wire is important too. I made sure that I used the same wire (or as near as possible) that Leo used all those years ago. 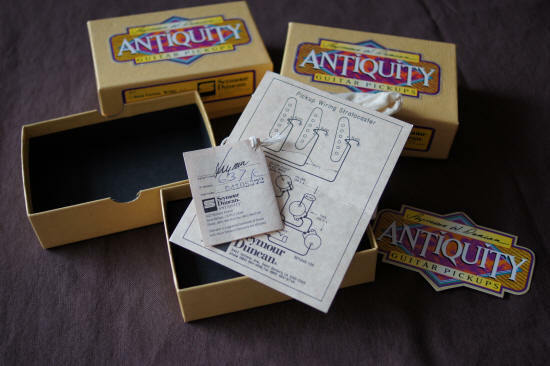 I got mine on eBay again for just a few dollars. I did fit the 5 way pickup selector though which was not the original design, but my thinking on this is that one of the few 'flaws' of that original design was indeed the 3 way pickup selector. 5 way is almost universal today. As you can also see from the above image I used an allparts capacitor in the circuit to help that original tone a little. Recommended part found on eBay. On a Stratocaster with rear mounting electrics, you could be left with holes around the pickups if you wood mount them from the front as this body design had. My solution was to use these gold pickup surrounds which were actually brass which had been gilded to a very high standard. 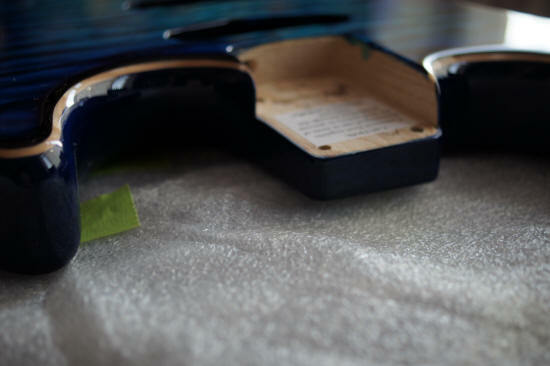 In this way, the guitar was 'dressed up' and looked in my opinion a far classier job than having holes around the pickups because there was no scratch plate fitted to this fantastic top. Each one was about $15 (£10) from eBay. They fitted perfectly, but remember ANY issues fitting these could damage the guitar top for good (ouch). 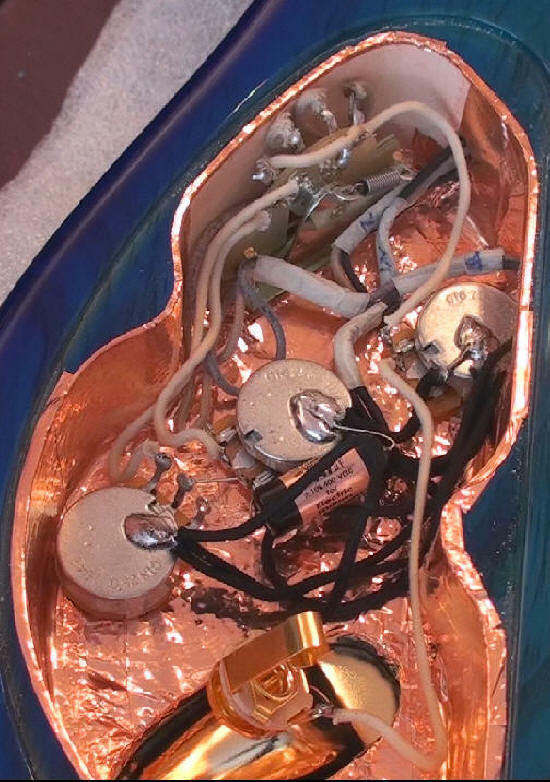 This one is being fitted to the Seymour Duncan Antiquity pickups that I used on this build - note the 'old' wiring. As set out from the start, I wanted to protect this guitar in every way I could. Partially because of the cost and partially because I really liked the guitar but also from history of lending a guitar to someone - it can be a painful experience - more so to the guitar than you. So I decided to fit the Fender genuine gold strap locks. These consist of a part for the guitar (where the strap pegs should go, and the second part that fits on the strap. This second part 'locks' on to the guitar and cannot come off unless you remove it - however they are heavy! Check this out above where I say: This modification is usually used if you have a rear routed control compartment. The reason is, that if you do not do this, then the neck sits a little higher in the body (to facilitate the scratch plate). Of course, with a rear routed body there is no pick guard so you can 'afford' to drop the neck by .720. This makes the neck sit right in this body. As you can see, the finished neck plate turned out rather nice... if not quite as nice as I originally planned... The Jeff Beck Neck was modified to handle this neck plate. Basically one hole filled, and one hole drilled. At last this guitar was finished, and apart from some simple setup and polish there was the final guitar right in front of me. To build a guitar like this (of this exact specification) does take some skill but its not rocket science - its guitar assembly really. Leo had this great idea all those years ago to make what is almost a DIY assembly job - and that was a great design that has stood the test of time and sound just awesome for most styles of music. There were a few times when I had to grit my teeth - especially at suppliers who did not care too much, but mainly when there was a critical part to the build or procedure that could wreck the guitar - get it wrong and your guitar would look bad - and that error would face you forever. In my case I would have sold it! But actually I did not get a single thing wrong - the guitar plays as good as any guitar I have from any manufacturer and at any price. You could say that this guitar is more than the sum of its parts. My video page here shows this guitar in action so you might want to take a listen at the finished results of tone from this monster (no not me you fool) :-) the guitar. Sound speaks louder than anything I could say about this Fender Stratocaster I call 'Blue' and I think you will like the sound of this guitar too. But if you don't? well that does not mean that you cannot make a guitar similar to this but with 'your' sound and preferences - it just means that you need to think about the tone you want out of your guitar and buy the correct parts to do that. 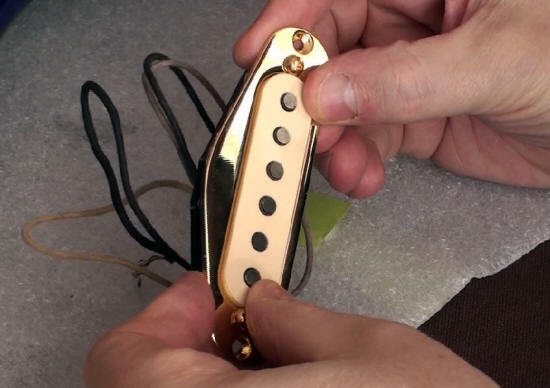 To that end I am going to review the 'Bladerunner' and the Seymour Duncan 'Antiquity' pickups on other pages of this site in due course because I think it can help when deciding whether to buy those products by getting a completely independent review of those parts. It's really hard to get no Bull***t reviews these days, typically most reviewers or magazines or artists are 'paid' in one way or another for their 'unbiased' review and that's a standing joke if you think about it. Imagine getting paid for a review (whether by advertising or free kit or... you fill out the spaces on this... then doing a bunk review. Why I've seen many really good guitarists sitting there in dealers premises saying how 'great' the kit is, but in real terms the guy is being 'paid' to do it. You could imagine the scene... you're getting paid to do the review... then you tell everyone how 'crap' the kit is... really? It's funny beyond words. And that's EXACTLY why I write these reviews on this website. Simple, truth and absolutely no bias except in the amps when you replace the tubes. One reason why you should visit this website BEFORE you actually buy anything - just check if I reviewed it and find out the truth before you are lumbered with rubbish, or shall we say, far less than what the manufacturer said it was. This review of the 'Blue' stratocaster should give you an insiders view about whether building this guitar and the suppliers or manufacturers herein are for you or not. Overall for the finished instrument this one gets a 9 out of 10. Try and buy one as good... I think not. By the way, this guitar all in (excluding my time) but including a brand new Fender case complete cost me approximately £1500.00 (that's about US$ 2100.00) so you might be REALLY pressed to get a guitar like this for that money. Actually unless you build it you can't! And below is a video close up. Remember that this guitar is featured under the 'how to build your own guitar' on this website.